Plexiglass. Crystal clear acrylic PMMA sheet. It's a beautiful thing when you take a sheet of acrylic, cut it, polish the edges and peel the paper off. It's light - half the weight of glass. It's friendly. Glass breaks into a gazillion pieces. 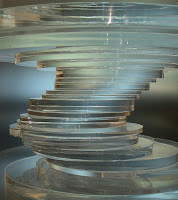 Plexiglas breaks into a few dull edged chunks - if it does break at all. I feel safe near Plexiglas. I am scared of all glass. Except maybe a wine glass. Clear Plexiglass sheet is made in 2 basic ways. 1. The original process, and still used today, is the cell casting method. I think it's a classic way of making acrylic, much less any material. A chemist mixes all the right chemicals in a large pot and pours the liquid between 2 sheets of glass. The production team must keep the sheets evenly spaced - whether the casting is vertical or horizontal. This casting is then placed in an autoclave and cooked for a couple of days. If all went right, the sheets of glass are separated and a sheet of acrylic is removed. The gasket used to seal in the liquid between the sheets still surrounds the finished sheet - which is cast larger than the final dimension required. (a 48x96 might start out as a 52x102 sheet and then trimmed down). The gasket is trimmed (except on the largest sheets like 72x120 to protect the edges) and the sheet is masked with a heavy paper or polyethylene film. Cell Casting produces a sheet with the highest molecular weight - making it more chemical resistant and a bit harder surface than extruded acrylic sheet. Due to the method of casting, there are wider tolerances on the thickness throughout the sheet. The middle of the sheet is typically thinner than the edges by up to 15%. In most applications, this is not an issue. Textures are created in the cell cast method by using glass sheet with that texture. Different thicknesses of acrylic are cast by changing out the gaskets. Of course, as the sheets get thicker, it takes specialized equipment to handle the weight of these sheets. Sheets up to 4" thick are regularly made here in the USA. Castings of acrylic even thicker are made by special order. 2. The most efficient manufacturing processes, and most common, is extrusion of Plexiglas sheet. You need a pretty big "room" to do this right. At one end will be a silo of dry acrylic pellets about the size of rabbit food. At the other end is a traveling cutoff saw and stack of pallets. What happens in between is proprietary to each manufacturer - but goes something like this: after the pellets leave the silo they enter a pipe with a large heated screw that turns the solid pellets into liquid acrylic. This pipe may be up to 10-12 inches in diameter. It passes through several filters to remove particulates in the resin and dumps out into a series of highly polished metal rollers where the liquid is spread from side to side - creating a waterfall of liquid acrylic sheet. This ribbon of plexiglass sheet winds it way in, out, and around 4-6 rollers before it cools enough to head horizontally down the final stretch toward the saw. The rollers are temperature controlled to cool the acrylic. The rollers play a very important part in the extrusion process. Highly polished rollers produce crystal clear sheet. A roller with a texture can produce non-glare sheet, textures for patio tables, or frosty textures. With the latest equipment, plexiglass acrylic sheet can be extruded up to 1" thick (which is really 25mm or .940"). Extruded sheet has a lower molecular weight as a function of the manufacturing process. OK - now that you know all this fascinating data... why should you care? It depends. Since the predominant material out there is extruded acrylic sheet, it is perfectly fine to use with 98% of the applications out there - windows, machine guards, display cases, brochure holders, cages, trays, etc. You MUST use cell cast sheet wherever there will be continual stress on sheet. Like say, an aquarium or vacuum chamber. Experienced plexiglas fabricators know this and it's not a choice - that's what they will use. Remember - higher molecular weight plastic materials always perform better than their extruded counterparts. Acrylic is a derivative of natural gas: see chart below. You are an angel. I couldn't find this information anyware else on the web, not even in wikis. Its easy to understand and exactely what I was wondering. What is the most common manufacturing process of Plexiglas? I guessed it was extrusion but I wasn't sure but now i know. Thank you very much! Very cool info. Now for my next project I can know what to choose. It almost sounds like you may have been involved in the process of making plexiglass.